Nepal's Prime Minister Khadaga Prasad Sharma Oli's upcoming five-day visit to China, his first after re-election (December 2017), will see the two countries signing dozen of Memorandum of Understandings (MoUs) including the construction of a railway line connecting Kerung (Gyirong) in Tibet Autonomous Region (TAR) to capital Kathmandu (touted to be US$ 8 billion mega-project, an estimation) and one on energy cooperation. In recent years, Beijing has pledged US$ 8.3 billion to build roads and hydropower plants in Nepal even as Indian commitments remain at meager US$ 317 million . The newly re-elected Nepali administration has been sending signals that it's country desire to establish a more balanced position between China and India, following India’s 2015 decision to create and execute an economic blockade at Nepal's southern border over its treatment of the Madhesi minority. A report carried by China Daily in August 2016 said the country has accumulated technology and experience to build a rail link between the TAR and the South Asian subcontinent via Nepal . Kerung (Gyirong) is lying at the Nepal-China border stands at an altitude of 2,800 meters above the sea level. The mountain pass to Nepal lies at around 1,800 meters, making the railway geographically feasible. The railroad will cross into Nepal through Rasuwagadhi border point. The 106-kilometer-long Pasang Lhamu Highway already connects the Rasuwagadhi border to China from Galchi, setting a precedent for another link. According to the most recent five-year-plan, the Xigaze-Kerung (Gyirong) Railway will enter into operation by 2020. Additional tracks are also planned from Xigaze to two more border towns by 2030 - Burang and Yadong. 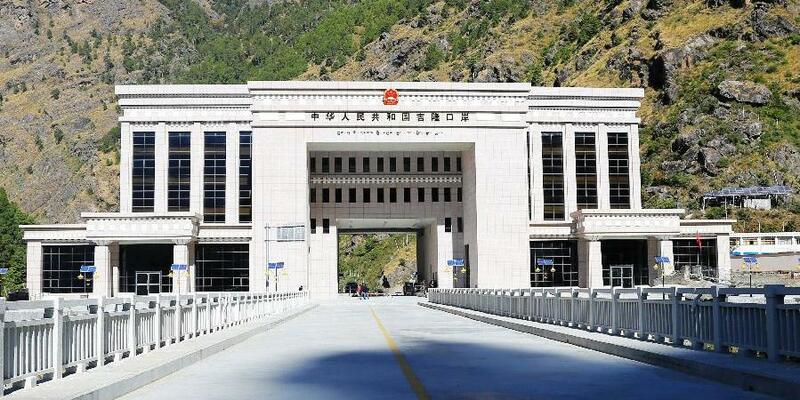 In July 2017, Losang Jamcan, chairman of the TAR Government said that building railroads is the best way to open up Tibet to trade from South Asian countries, particularly the large Indian market. The policy experts in India are seeing these developments as Nepal's way of choosing a new strategic partner in China. However, China is categorically denying such interpretations . On April 18, 2018, China's top diplomat State Councillor Wang Yi said he invited India to participate in connectivity projects between the three nations - China, Nepal, and India. He added, "We hope that such cooperation can contribute to the development and prosperity of all three countries." Image Attribute: Nepalese Prime Minister K.P. 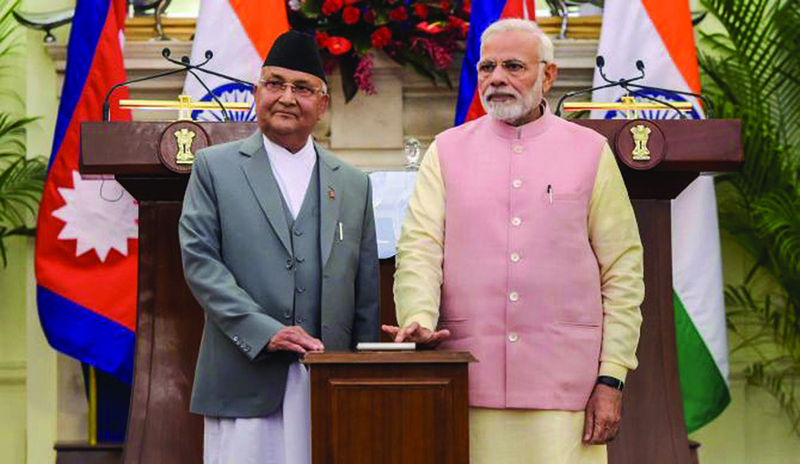 Sharma Oli and Indian Prime Minister Narendra Modi jointly lay the foundation stone for Arun-III through a remote system on May 11, 2018. 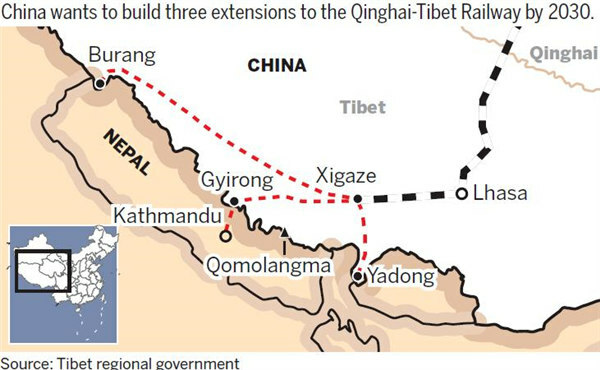 In April 2018, during Oli's visit to New Delhi, India offered to construct a rail link to connect Raxaul (Bihar state) and Kathmandu and to develop the inland waterways for the movements of cargo and providing additional access to the sea for Nepal , that has also be courted by China with its transport deals. 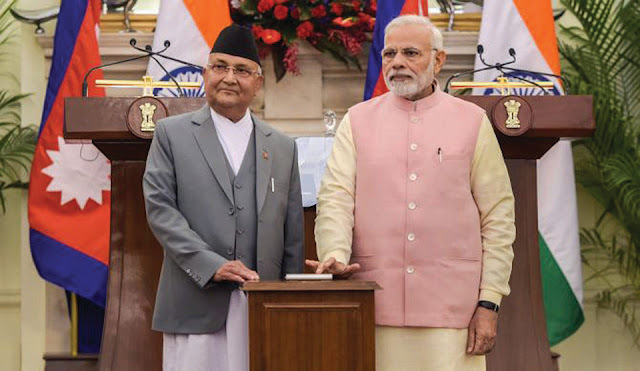 A month later, in May 2018, Indian Prime Minister Narendra Modi visited Nepal aid the foundation stone of 900 MW Arun-III hydro-electric project along with his Nepalese counterpart . The foundation ceremony was conducted in Tumlingtar area in eastern Nepal through a remote system. The project is expected to bring in USD 1.5 billion foreign direct investment into Nepal and create jobs for thousands of people. Additionally, Modi reaffirmed India's commitment to building a strategic railway link to enhance people-to-people contact and improve trade relations. Currently, Indian firms are the biggest investors in Nepal, accounting for about 46 percent of total approved foreign direct investments (FDI), almost 100% of petroleum supplies, a significant share of inward remittance on account of pensioners and workers and are working in the manufacturing, services, power and tourism sectors. Some large Indian investors include ITC, Dabur, Hindustan Unilever, MTNL, State Bank of India, Punjab National Bank, Life Insurance Corp and Asian Paints . In 2016-17, Nepal imported $6.1 billion worth of goods and services from India and exported only a little more than $400 million worth, making for a trade deficit of over $5.7 billion . For Nepal, India’s unkept promises such as the Nepal's National Armed Police Force Academy, eventually being built by China and poor project track records in its territory, such as the India-funded road projects in southern Nepal or the high-profile hydropower project on the Mahakali river - led to the destruction of India's own credibility. And, the Madhesi related blockade was the tipping point, making Nepal suffer a serious energy crisis and was forced to turn to China for help. 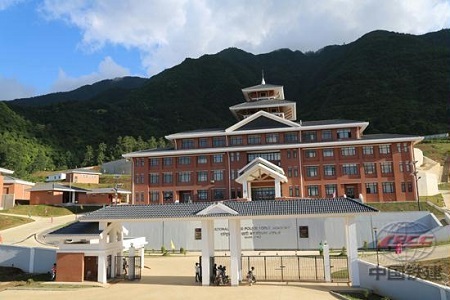 Image Attribute: Nepal's National Armed Police Force Academy, promised by India, but eventually built by Chinese. Inaugurated on March 19, 2018. "We can’t forget that we have two neighbors. We don’t want to depend on one country or have one option," Prime Minister Oli said to SCMP daily on February 28, 2018 . "With a new constitution and completion of elections to the three tiers of government, we have completed our political transformation. As we begin our journey as a federal republic, it’s now time to refocus our attention to Nepal’s economic transformation." China's proposal for a trilateral cooperation with Nepal and India which came in late April 2018 is an apparent signal to India to understand the geographical advantages. Nepal's standing as a natural beneficiary from sound cooperation from China and India is crucial for the overall development of the region. Do note, India has yet not extended support to President Xi's flagship initiatives under "Belt and Road Initiative (BRI)", primarily because of China-Pakistan Economic Corridor (CPEC), which passes through Pakistan-occupied Kashmir (PoK). However, India has kept its options open to cooperate with Chinese in proposed Bangladesh-Bhutan-India-Nepal (BBIN) corridor. What India fears that Chinese loans for projects under BRI have high-interest rates and terms and conditions are not transparent which could led Nepal to a debt-trap. Last year itself, with more than US$1 billion in debt to China, Sri Lanka handed over a port to companies owned by the Chinese government. Nepal's tight-rope diplomacy if not played well, the country will lose at both the ends. And, unlike Sri Lanka's case, India will not sit idly to face a bankrupt Himalayan neighbor with negative buffer value.